Welcome to the final stop on Kimberli’s Creations Halloween Blog Hop or if you just landed here, you are in the perfect position to visit with me and get right on the course with Kim. 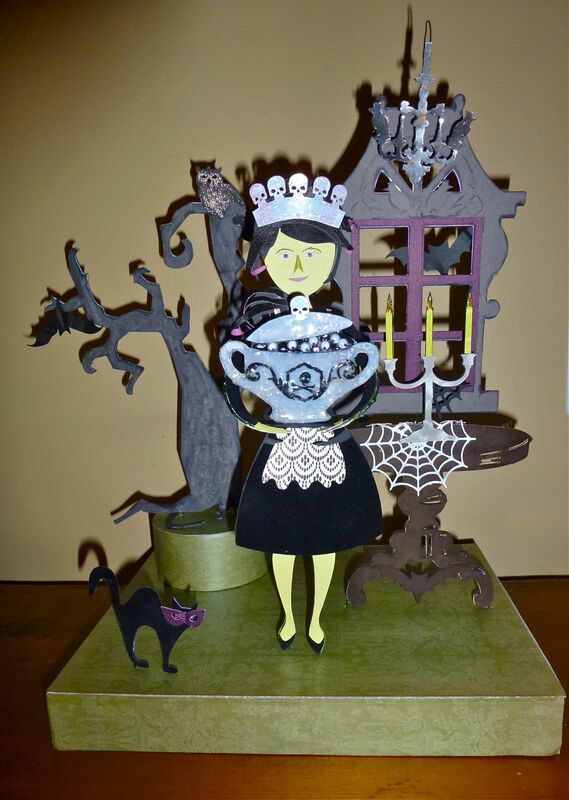 There are several talented ladies who will be sharing fun Halloween projects with you today and perhaps inspire you to create some Halloween crafts of your own! There will be some fun giveaways along the way, so be sure to hop by each of the blogs so you don’t miss any! This is Natalie and she is assisting the skeleton with dinner party duties at a home in Paris in the 50’s. You will see a lot of familiar facial features a la Nadia Herbst-McConnell. The images are from Chic and Scary, Country Life, and French Manor. I used chipboard and wire to make the figure. furniture, and tree free standing. Amplifying details on wiring are available on my earlier post on Halloween Home Decor. I will be giving away a new Teresa Collins Chic and Scary Cartridge to the first person who correctly identifies the number of images from the Chic and Scary cartridge that appear on my Halloween project above. There are some simple guidelines to follow. You do not need to follow my blog. If you see something that makes you want to follow, you are welcome to join and I thank you. Count each individual image. For example, if a row of connected spiders was cut out and one spider was hand trimmed away from the row and appears somewhere separately in the project, count the separate spider as one and the connected row of spiders as another. Images with hand trimmed layers (e.g. one image cut several times in different papers, trimmed and reassembled as one image) count as one. Separate images that are combined together (e.g. a mask and a cat) count as two. You may play if you already have Chic and Scary and wish to either “gift” the cartridge to someone else or RAK it. If you win, it’s your decision. If you want to play along and already own the cartridge and don’t want to make a decision as to its future, simply say “I pass” and I’ll move on to the next person who correctly identified the number of images. And if you just want to comment and not count images, thank you for that too! Due to the cost of shipping, the winner or the selected recipient must have a mailing address in the U.S., Canada, Mexico, or the UK. This is a 24 hour contest and ends at midnight (Eastern time) on 28 October. Comments will not be revealed until the contest has closed. You will not be able to see how many others have answered before you and you will not see their answers. I will contact the winner via the email address you provided when you made your comment in order to get a mailing address. You do not need to place your email address in the “body” of your comment. And most importantly, have fun. And if you haven’t visited the other blogs, give it a quick look. Lots more fun to be had. So creative! I love it! I count 12 images. Oh my gosh! This is absolutely amazing. I’d put you last on the blog hop too…who’d want to follow such an amazing creation. The eye soup is genius…..as is every other amazing detail on this project. Sometimes insomnia pays off. This is gorgeous! You are crazy talented! Cheers to a show-stopping project!! The figure is fantastic with that tureen of eyeballs! Love the dimensional face and hair! Oh! the way you altered the window’s and table’s woodwork for creepy grandeur is just perfect!! I am in love with your style of positioning cuts on a base. Unless that is proprietary info, I would love to see what the underside of that base looks like with the wires!! So fascinating! I love this finished quality your projects have due to the bases. It really looks remarkable! I see 12! Thanks for a fun giveaway. Have a great day! Totally love this! Her cap is over the top! I’m going with lucky number 13! Holy moley! No idea how many cuts! I will guess 20, but I can’t wait to know the answer. I love her, I love the setting, the ‘soup is great’ and I am going to try that ‘wiring’ technique of yours as soon as I get a minute! Great project, as always! Thank you. My guess is 16 total Chic and Scary items. Terri_ski at yahoo dot com. im guessing 12…lol…I cant tell if there is something at her neck or not…so I’ll go with 12. Love your piece! Wow! This is amazing and took so much work! I love it!! I would guess that there are 13 images. Thanks for the chance to win such and awesome prize! My guess is 14. At least that was all I could find. Love how you used some cuts to work into the background. Cool effect. I am sorry. I still can’t get through, I don’t think. Delete my last two comments if they did go through! Basically, I love your work, you ROCK! Secondly, you are awesome to giveaway a great cart! I will guess 13 images, for lucky 13! I am following, I just love your blog! I love these hops because I find great blogs to follow! Thank you. Ohhh! So awesome! I love it! My guess is twelve. (I was already one of your followers). I love this, such a fun idea and I love your story to go with it!! I think there are 13 cuts from Chic and Scary – fun way to do a giveaway! Thanks for participating in my blog hop!! Happy to have hopped in to visit. Would love it if you would stop by my blog sometime, too. This little trivia guessing game is fun! I count 18 cuts, am I even close? LOL I would love to own this cart now that I see all of the fabby things you have done with it!! !